Walks 'N' Wags' Pet First Aid Classes are to our knowledge the most comprehensive pet safety and pet first aid program available. Why Walks 'N' Wags Pet First Aid Classes? Walks 'N' Wags are the longest standing Pet First Aid program in Canada. Upon successful completion IAABC AND PSI members are eligible for CEU (continuing education) credits. You'll receive a beautiful Certificate of completion upon passing the course. Walks 'N' Wags works with live pets to experience them wiggling about as you try to bandage them and find their vital signs! Utilize our logo on your web site or print materials to confirm you have completed our program and add recognition. And will be added to the professional participants page of our web site with a direct web link to yours. Certificate is valid for 3 years from course completion. Requests for replacement certificates must be made in writing and are $15 CAD. To many of us, our pets are family members. Walks 'N' Wags has been offering Pet First Aid Classes since 2003. 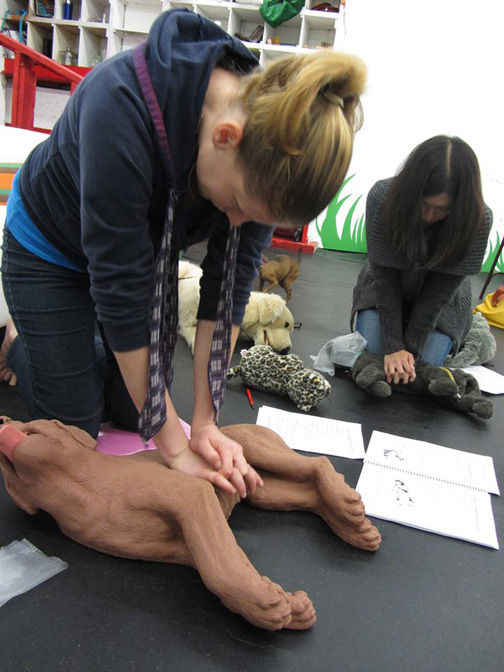 The WNW pet first aid course was originally developed in 1993 by Nurse Ethne Dickinson of Oakland Educational Services Ltd. and a team of Veterinary professionals. In September 2007, Ethne passed over the administration over the program to Walks 'N' Wags. Since that time, Walks 'N' Wags Pet First Aid program has been updated and is reviewed regularly by a Veterinary panel for accuracy. Our goal is to train quality Pet First Aid Instructors to provide fun, hands-on education to pet owners and pet care professionals. Interested in participating in a Walks 'N' Wags Pet First Aid course? No previous first aid experience is needed. Sign up today! You will have a fun, informative day and leave feeling confident that you can be there in your pets' time of need. If you would like to arrange a private class for a shelter, dog club or other group feel free to contact us for cost and details. CLICK HERE.